I bought a game to my Sega Mega Drive the other day. Its the Zero Wing side-scrolling shoot ’em up game from 1989. The game was originally created as an arcade game, and was ported to Sega and to PC. 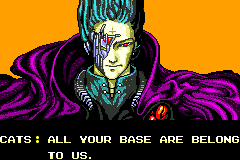 This was the source for the internet phenomenon called All your base are belong to us.